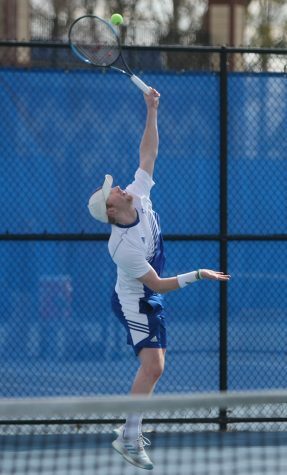 Gertjan De Wilder hits a backhanded shot in his doubles match during the Eastern men’s tennis team’s 6-1 loss to Jacksonville State March 22 at the Darling Courts. 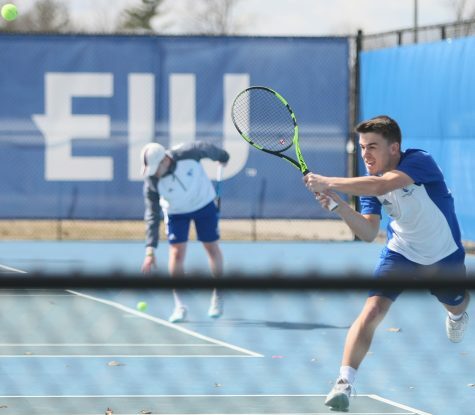 With the last home conference match of the spring season Friday, the Eastern men’s tennis team accomplished so much in little time. The Panthers changed drastically standing at 13-13 on the year and 1-3 in the OVC, which ties the most wins they’ve had in over 10 years. Eastern could make that 14 wins and be over .500 for the first time since 2008, battling Austin Peay Friday at 10 am. Another astounding stat that’s seen an uptick is the wins on the road. With two more wins on the road last weekend, the Panthers’ total is now nine, the most they’ve seen in over 10 years as well. The season might be coming to a close, but junior Freddie O’Brien continues to make an impactful presence on this Eastern team. 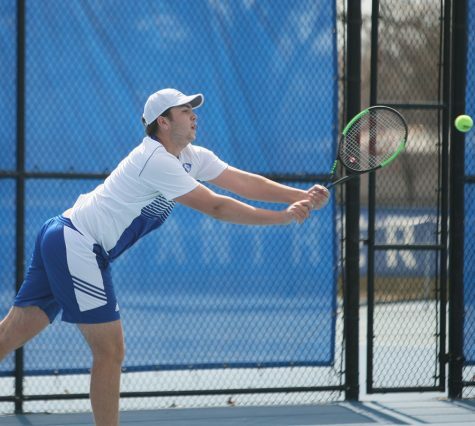 O’Brien was awarded another OVC Male Player of the Week, dominating his competition after going 3-0 playing at No. 1 singles helping Eastern to post a 2-1. 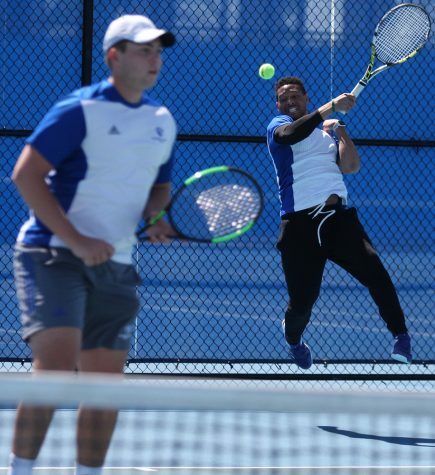 Not to mention, last weekend, O’Brien opened the weekend with a big win over the defending OVC Male Tennis Player of the Year, Hendrik Inno of Belmont. He also went 1-1 in doubles action. 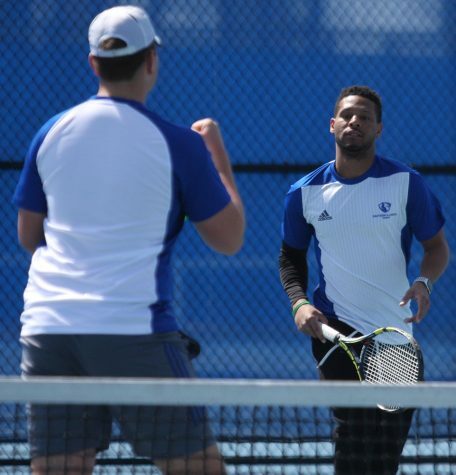 Then, O’Brien racked up two more wins at Tennessee State and Martin Methodist, improving to 15-7 this spring. O’Brien has also increased his win total from 11 last season and losing two less matches. 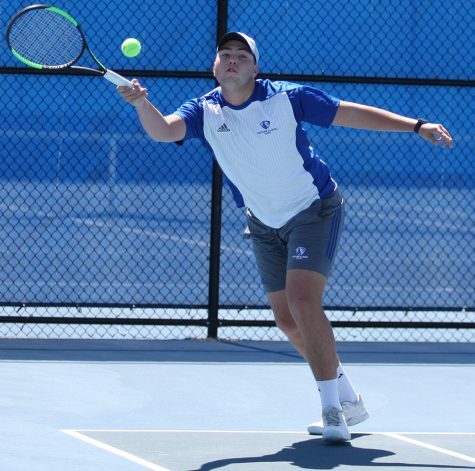 This marks the second time this year that O’Brien has won the OVC Male Tennis Player of the Week award. 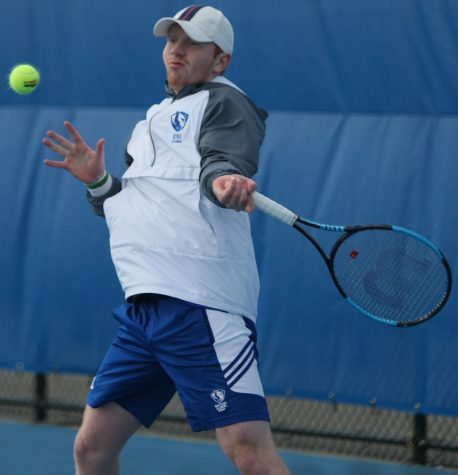 If O’Brien can win another singles match against Austin Peay, it would move him into a four-way tie for fourth all-time in singles dual meet wins in program history. Previewing the Governors of Austin Peay, they have the complete opposite results than Eastern. The Governors are 5-13 and have lost three consecutive matches. A big key in this match for Eastern is that Austin Peay has yet to win a game on the road, and the Panthers are 2-1 at home. Sophomore Mike Jansen in his first season in the Panther blue, said the team is ready to go and that he’s having a better outlook then earlier in the season. 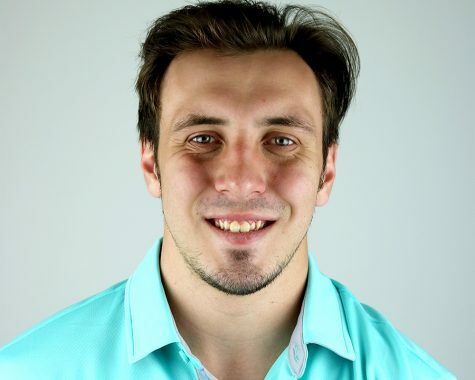 Knowing what sophomore Logan Charbonneau saw in his first season with the team last year, it’s changing for the better. “The special thing for me about this season is that we’re building not only a new culture but a belief in our team.” Charbonneau said. The Panthers have a couple weeks off after Friday before going to the OVC tournament April 26.